As a quick update to this report on the region availability of Metal Gear Rising: Revengeance on Steam, it seems Konami have now made it so that Irish gamers will be able to buy the PC version of Revengeance. But as of today, the store page should be working properly. This decision does not extend to other regions, with Japan and many other Asian countries still unable to buy it from Steam. Also of note, the region locking of serials from other distributors is still in place, and as is the cross-region gifting block, but this is great news for customers residing in The Republic. Pretty sure this justifies my claim that blocking it in Ireland was just an honest (if stupid) mistake. Glad to see it fixed. 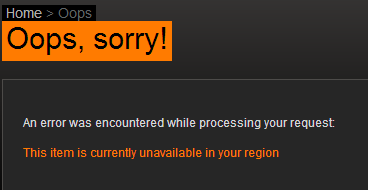 I’d been refreshing steamdb.info a couple of times a day since I expected this. Doesn’t justify continuing to block it in all those other countries though. Now just need Greenmangaming to catchup. EDIT: Trying to access from Ireland, Dublin. Same here, accessing from Dublin as well. Living in Dublin here, and I still can’t access the game. I was disappointed that I couldn’t pick it up during the sale. I’ll keep an eye on it during the day anyways. For those in Ireland still unable to purchase it, try both the Steam client and the web store, and try restarting Steam. Konami’s rep said that it might take up to 24 hours to update for some users. Thanks for the update, was wondering why I couldnt buy the game. In Ireland here, still can’t access the sale page….hope it updates soon.